The “Can Do” Kids Cooking Club’s Raspberry Cream Dessert Was a Big Hit at the Red Hat Society Ladies Meeting ! The local chapter of the ladies of the Red Hat Society met at the “Can Do” Street Community Center yesterday. Members of the “Can Do” Street Cooking Club made a special dessert in their honor. Since the ladies always wear red hats, Yundi suggested a dessert that had red in it. The other members of the cooking club liked that idea and began thinking of things that were red. Annie suggested strawberry jello . Hector suggested strawberry ice cream since that is his favorite and he was hoping there would be left overs! Nellie suggested red velvet cake. Bobbie suggested strawberry shortcake. 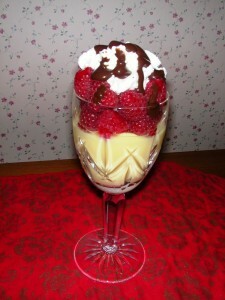 Then Kathy came up with the winning suggestion…raspberry cream pudding. Everybody cheered! Not only is it a pretty dessert, it always tastes great and is so easy to make. The Red Hat ladies loved the raspberry cream and gave the cooking club a round of applause. The “Can Do” Cooking Club thought you might like the recipe just in case you want to make raspberry cream for your family. Beat with a wire whisk or on low speed of electric hand mixer for 2 min. Serve and watch everyone enjoy Raspberry Cream!